Morgan Robinson and maintenance workers install the artist's new sculpture, "Shooting Star." 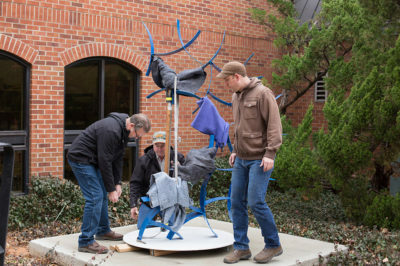 Oklahoma City University’s School of Visual Arts installed a new sculpture on campus today by artist-in-residence Morgan Robinson. The piece, titled “Shooting Star,” was set in place near the entrance to the Norick Art Center. The metal sculpture is donned in the official blue color of the university and its name reflects the OKCU nickname, the Stars. Several other pieces by Robinson are on exhibit around campus and at the downtown School of Law building. The Norick Art Center will host a solo exhibit for his work in the spring. His sculptures will adorn the Hulsey Gallery from April 3 to May 9. Robinson is an artist from Stillwater who works primarily with wood and metal. More information is available on his website at morgan-robinson.com.